The timing for tonight's dinner was perfect in that the temperature suddenly dropped into the 50's. I had been worried earlier in the week when all the ingredients building up in the fridge would make a perfect seafood chowder because I hate eating soup when it's over 80 degrees out. I guess the gods were smiling down on me. The soup gods! For the chowder I rendered some salt pork and bacon. Then I cooked some onion, celery, red pepper, red potato, and corn. I used the leftover broth from Monday's clambake and a little milk which I thickened with some roux before adding fresh chopped dill to the pot. 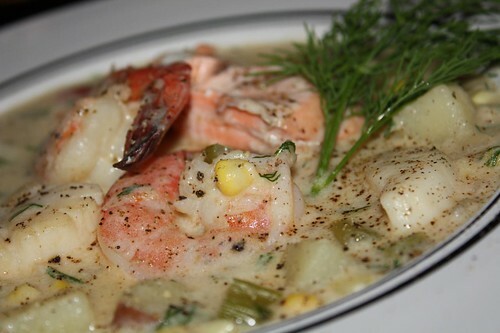 In a separate pot I poached a little cod, salmon, shrimp, and scallop to add to the chowder when I served it. I also purchased some littlenecks which I foolishly left in the fridge and forgot to serve. 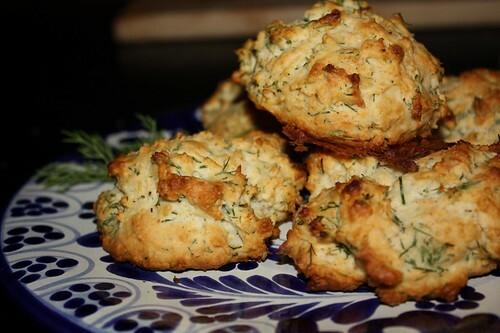 To go along with the chowder I made these drop biscuits with fresh dill. It's always troubling to me to pair any sort of wine or beer with any kind of soup. It seems very unusual to me to accompany liquid food with a beverage. I'm not sure if that's just me or if there are others out there with similar hesitation. It's probably just me. Starting in August this year I have seen more seasonal fall beers come out than I can ever recall in the past. My initial intention was to actually wait until fall to start trying them but as I realized that I probably wouldn't finish the reviews until well into the winter beer lineup I decided to just start up early on the fall beers. 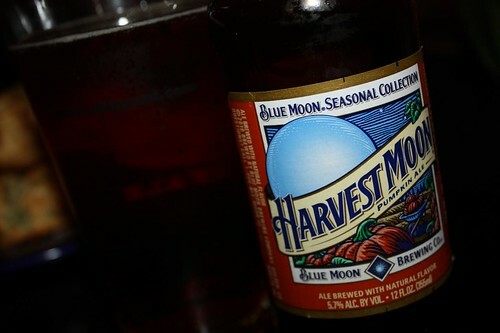 I started with Harvest Moon, the latest from the moon-obsessed Blue Moon Brewing Company. They may win the prize for the most annoying alcohol website. Not only do they demand you enter your birthday (which I always list as November 11, 1911) but they also ask you to select your state from this tiny alphabetical list of two-letter state abbreviations. In case that wasn't enough of a deterrent to you actually using the site it also is rendered completely in Flash for an extra level of annoyance. As for the beer it claims to be a pumpkin ale though I didn't really get that impression from tasting it. "Pumpkin" of course never means actual pumpkin, but in America always refers to anything with nutmeg, cloves, and allspice in it. I didn't pick up on much of that flavor but it was quite a tasty beer. I can't wait until fall, I'm going to make a pumpkin pumpkin pie where I put extra cloves, allspice, and nutmeg into a pumpkin pie to give it a pumpkin flavor. It's going to be revolutionary. Looks delicious! Those biscuits looked yummy. I do love biscuits! Also what is wrong with having tea with soup?! Tea with soup just seems weird to me!